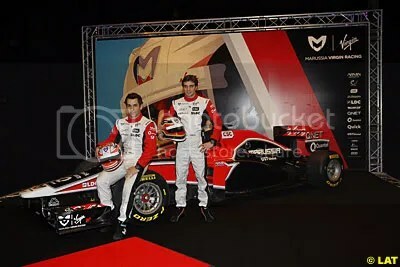 Marussia Virgin Racing have launched their car to take on the 2011 world championship in a lavish London ceremony. The Marussia name now preceeds Virgin following a major tie up with the Russian sportscar manufacturer and the team at the end of 2010. It has led to the new car being designated as the MVR-02. Designed purely by CFD last season, the VR-01 was largely disappointing mostly due to reliability issues, but the Cosworth powered team are hoping for better things this season. The new car is a clear advancement on last seasons machine, in a similar fashion to Team Lotus, the experience of a season with development has led to a much tighter overall package being produced. The Virgin features a much lower front nosecone than we have previously seen, and there is also an interesting exhaust design at the rear of the car – whether that is forcing some form of blown aerodynamics at the rear end we do not know. Nick Wirth, head of design at the team was clearly very happy with the new car, citing a serious gain in aerodynamic strength and reliability. “Since the middle of year we worked on process, we calibrated how fast we had to improve and what did we have to work on,” he said. The car still retains its red and black paintwork, but this year has some white thrown into the mix to make quite a good looking machine. 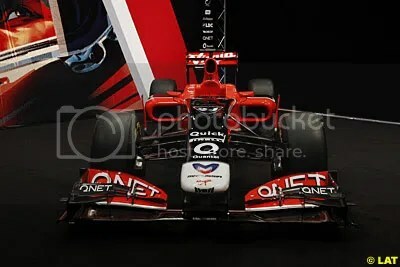 Various high profile sponsors including of course Virgin and Marussia, but also QNET and CSC have retained sponsorship with the backmarkers providing a good financial base. Timo Glock will race the car for a second season alongisde promoted rookie Jerome D’Ambrosio who ousted 2010 racer Lucas di Grassi from the race seat. Glock, 28, says he is hopeful of a big step forward this season. “We want to grab points in first races and then work from there,” he said. “We are much more sorted out, more structured, we have one year experience so we should be on a good way. “But we have to realistic, we were 3-4 seconds off the pace last year and you never catch 3-4 seconds in winter time, so we have to make some improvement and then move up. This entry was posted on February 7, 2011 by f1fanatics. 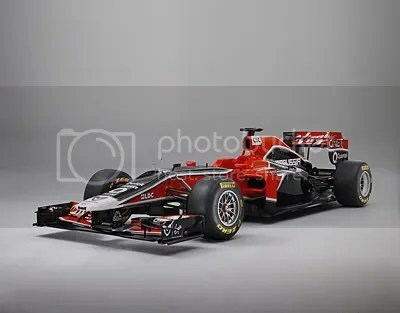 It was filed under Car Launches, F1 News, Virgin Racing (Manor) and was tagged with Jerome D'Ambrosio, Marussia, Marussia Virgin Racing, MVR-02, Nick Wirth, Richard Branson, Timo Glock. I’m Jordi from TheFormulaOneGP, I wanted to announce that I have created a new blog dedicated exclusively to cars. This will also have a links section and would like us to return to do a link exchange, but this time with this other blog. I want to appear as “FormulaCars” (title of the blog). I hope Your comment to confirm that you have added me. I will add you then. But attention, do not delete the link of TheFormulaOneGP because I will continue writing in it. I also hope your comments on my first entry into FormulaCars and know what you think about the blog.